There is an increase in demand for crane rentals near me due to the surge in business in the construction industry in Virginia. Throughout the state, new construction as well as renovation work is booming which is great. Unfortunately, companies are beginning to struggle to keep up with the needs of the market. That’s why when you hire someone to help you with a task; you need a company that is going to do the job right, on time and on budget. Our main goal when we begin any project is to make sure that all safety requirements are meant. Mistakes happen but it’s important that they are minimal, not only for the safety of the crew, but to ensure there are no major damages and delays. One of the reasons you have a need for all terrain machinery is because certain jobs will require different needs. We can accommodate any needs whether it’s in the middle of the woods or the middle of a city. While customers appreciate our dedication to safety, it’s our experience which truly separates us from the rest. What experience do you have? Experience plays a key factor in what company you go with. For starters, you know the job will get done right. You also know that they can handle multiple types of jobs whether it’s something bigger, smaller, rough terrain or anything else. You want to hire a crew that’s going to be able to assist you with any project that comes your way. What other services can you offer? Along with renting equipment, you are looking for someone who is going to go the extra mile to accommodate your needs. This includes repair options, storage, certified rigging and more. You may not need all of these options right away, but it’s nice to know that you can count on them if and when they are needed. How do we get started? Even if you are still in the bidding stages, we can assist you with the process by giving you an accurate idea of budget, time and anything else that will be needed for our aspect of the project. This helps you put together a more precise bid and keep the project on budget. 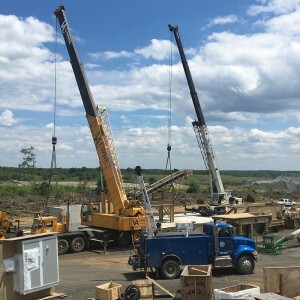 The best thing to do when you are looking for crane rentals near me is to make sure that you ask the company you are speaking with about their experience, what projects they can take on and what other services they are willing to offer. That’s why so many builders have worked with us for years and you should as well. At VA Crane Rental we take every job very seriously no matter the size, timeframe or requirements. If you need crane rentals near me there is no better place to call. Our selection of construction equipment allows us to take on any job. We also offer a great selection of additional services including HVAC moving, storage, rigging and equipment repair. To learn more about these services or to schedule a free on-site consultation give us a call today. Highly trained crews and well-maintained equipment combined with an exceptional safety record and personal service make sure your project deadlines are met. Call today for a free on-site consultation.